The REM 2017 Call for Abstracts ends tomorrow, Tuesday, May 16. Don't miss this extended opportunity to speak at Renewable Energy Markets 2017. We are seeking abstracts for panel sessions that are timely, unique, and informative. Sessions should be as discussion-oriented as possible, although some will need to feature presentations. We'd like sessions to feature new data or ideas, consideration of important issues, and most importantly, fresh and informed thinking about where renewable energy markets are headed. We're looking for dynamic, engaging speakers with a compelling story to tell. Beyond the Deal (for example, certification and risk reduction). 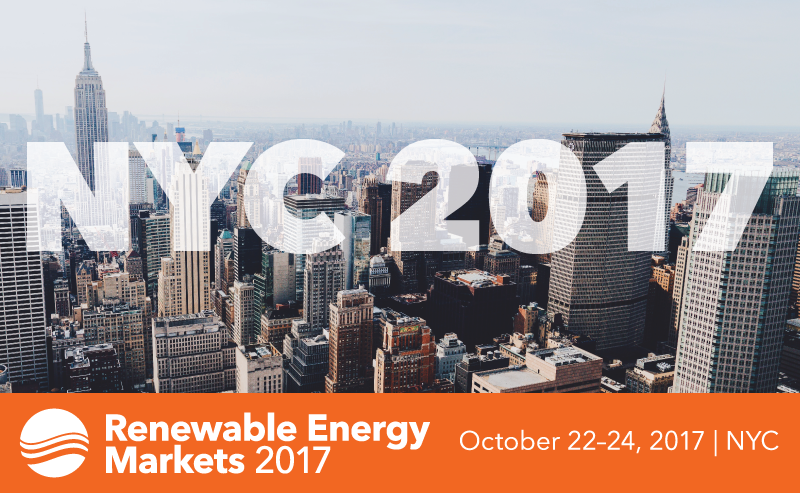 Registration is open for REM 2017, October 22–24th at the New York Hilton Midtown. Join over 400 leaders at the clean energy industry's most important annual conference, including renewable energy generators, electricity providers, utilities, corporate purchasers, and policymakers from across the country and around the world. With 2017 shaping up to be a year of surprises, you don't want to miss this opportunity to meet with and learn from the decisionmakers navigating this new policy landscape. Act fast and save 30% (nearly $500) off the week-of rate. The Super Early Bird rate will be available through Wednesday, June 14. After that, rates go up, so register today. Renewable Energy Markets couldn't happen without the support of our Sponsors. Consider the unique opportunity to get your name in front of over 400 decisionmakers from around the globe by becoming a REM 2017 Sponsor. Copyright © *|CURRENT_YEAR|* *|LIST:COMPANY|*, All rights reserved. No endorsement by the U.S. EPA is intended or implied. Older PostRegistration Open For REM 2017!